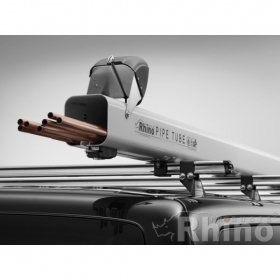 The Rhino Pipe Tube Carrier is manufactured from aluminium, with the nose cone combining a steel bulkhead for strength and a plastic nose cone to improve aerodynamics. It's crash tested to 20g with a 50kg load. The Pipe Tube can hold over 50 x 15mm copper tubes, and is 3 metres in length.